With 1:27 remaining and the Gophers leading Oregon State 30-23 after having just scored a touchdown in Thursday’s opener, head coach Tracy Claeys elected to attempt a two-point conversion. This was not unprecedented. It was the exact opposite of unprecedented, actually, since Claeys did the exact same thing last year when the Gophers scored a late touchdown against Illinois. In fact, the score at the time was exactly the same. And the game situation was virtually identical: 1:25 remaining. In that case, the Gophers converted and went ahead by 9. They went on to win 32-23. I loved the decision last year, and I loved it last night. Many others felt differently — some on Twitter and even more notably those in the BTN booth, including analyst (and ex-Gophers coach) Glen Mason. They acted like he was doing the most bizarre/dumb thing in the world. I acted like he was doing something that made perfect sense. With the benefit of hindsight, the decision wasn’t so cut-and-dried. It wasn’t crazy. It wasn’t genius. It was one of those classic things we can now dissect almost casually, particularly since the Gophers still won even though the two-point conversion in this case failed. What does the math say? Here’s where I was particularly wrong. 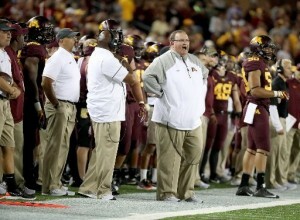 I made an assumption that the math would tell us that Claeys was doing the right thing. Namely: I thought that logically the chance to go ahead by nine points (and thus force an opponent to need to scores in a short amount of time) was worth the risk of being ahead by only seven with a miss instead of eight with a nearly automatic kick conversion. Oregon State down 7 points: 4.2 percent chance to win. Oregon State down 8 points: 1.8 percent chance to win. Oregon State down 9 points: 0.8 percent chance to win. For the sake of math simplicity, let’s assume the Gophers make the 2-point conversion 50-percent of the time and make the kick 95 percent of the time. Oregon State’s chances of winning are a little worse than 2 percent if the Gophers kick, and they’re about 2.5 percent if the Gophers go for 2 (the average of 4.2 and 0.8, assuming a 50 percent conversion rate). At least that’s how I add it up. It’s a marginal difference, and again it’s using an NFL model and loose conversion estimates — not to mention generic factors that don’t take into account specifics about either team. But I would imagine the numbers come out pretty close in college, too. A reason to still like it: The percentage difference, assuming the NFL model reliably translates to college, is negligible enough that there isn’t much risk involved regardless of the outcome, but it still FEELS bold and has the chance to have an impact on a team as a confidence-instilling kind of thing. It has a “going for the dagger” feel to it, and players can feed off of that. A reason not to like it: Claeys told reporters after the game that he wanted to make three yards and “end the game.” He told BTN as he was coming off the field that his assumption is that even if Oregon State had scored a touchdown, the Beavers likely would have kicked the extra point. Hence, he still felt like a seven-point lead (worst-case scenario) left the Gophers in no worse shape than a possible tie and overtime. But against an inferior opponent, I’m not so sure. If Oregon State had come down and scored a touchdown with, say, 20 seconds left and had a ton of offensive momentum going, it wouldn’t have been shocking to see them go for 2. So it’s at least possible that with the Gophers going for 2 (and missing it), they left themselves vulnerable to a situation where one drive could beat them. If you kick and make (which is very likely), you assure yourself of no worse than a tie, of course — in the event that Oregon State can score a touchdown and a two-point conversion against your defense (a unit that, by the way, is better than your offense if you’re Minnesota). These are points that were made by others last night on Twitter, and they were good ones. In a scenario where the Gophers were the underdog — playing, say, Ohio State — the go-for-broke mentality might make more sense. Against a team you’re supposed to beat? The risk might not match the reward.